The style is, pretty much, exactly what it sounds like: Cut the back, but don’t cut the front. Well, okay — definitely get the front trimmed, at least, because no one likes split ends, but make the front considerably longer than the back. It’s like a graduated bob, with more length. And that’s exactly what celebrity stylist, Jen Atkin — who also happens to be a hairstylist for Jessica Alba, Gwen Stefani and Khloe Kardashian! — gave Chrissy. “@chrissyteigen rocks a new ‘Don’t cut the front’ haircut,” Jen wrote in the caption of her Instagram post yesterday. Since she also tagged stylist Priscilla Valles for extensions, it’s clear Chrissy needed them to get the full look she wanted. Still, this seems like a low-maintenance style that is easily attainable for any gal who already has long hair. Jen also noted that she and colorist Marie Harmon came up with the name, so you can bet this is a new trend that will only gain steam now that our fave supermodel is rocking it. Chrissy hasn’t shared anything about her new ‘do, but she did post a Snap of herself covered in foil in the stylist’s chair. 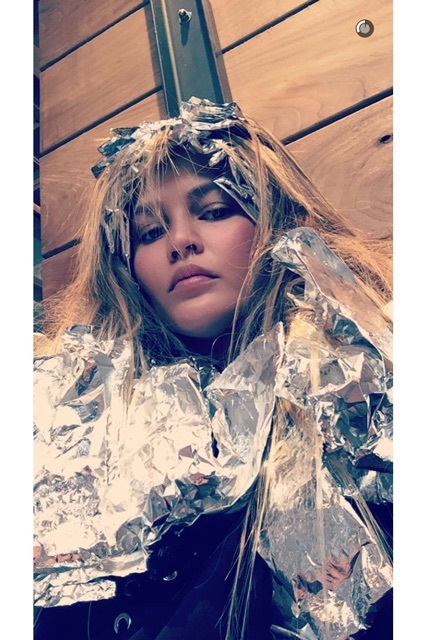 We kinda love that Chrissy takes these foil-covered photos from the salon, just like we do. A stylish way to cool off your neck in the summer AND look like Chrissy Teigen? Yep, we’re all about this “don’t cut the front” trend.